The Microsoft Surface Corporate Vice President Panos Panay has today in a blog post revealed a new Surface tablet, the – Microsoft Surface 3 – . The Surface 3 has a lot of resemblance with the Surface 2 and Surface Pro 3 devices. The natural replacement to the Surface RT tablets as it runs desktop applications with a full 64-bit Windows 8.1 and will be available with Windows Pro for business customers, It also will be upgradable to Windows 10 for free when it’s available. 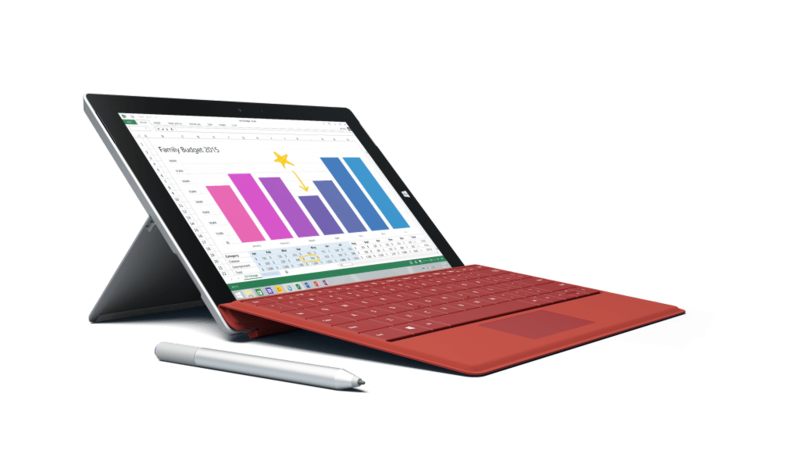 The Surface 3 powered by Intel’s newest system-on-a-chip, the Quad-core Intel® Atom™ x7 processor is the thinnest at 8.7mm and lightest Surface to be produced so far at 622g (1.37 lbs.). It has a 10.8″ screen but uses the 3:2 aspect ratio form factor as the Surface Pro 3. Surface 3 spots 3.5MP front and 8 MP rear-facing cameras that both capture 1080p video with a battery of up to 10 hours and features a new Micro USB charger so you can basically use the same connector as most mobile phones, also comes with a 3 stage kickstand. It includes a one-year subscription to Office 365, Outlook and OneNote and 1 TB of OneDrive storage. And it starts at $499. The Microsoft Surface 3 is for you if the majority of your work is less intense – working in Office, writing, using the Internet (using IE, Chrome, or Firefox! ), and casual games and entertainment, then you’ll find that Surface 3 delivers everything you need but if you do very demanding work – things like editing and rendering video or complex 3D modelling – then the power and performance of a Surface Pro 3 is for you.